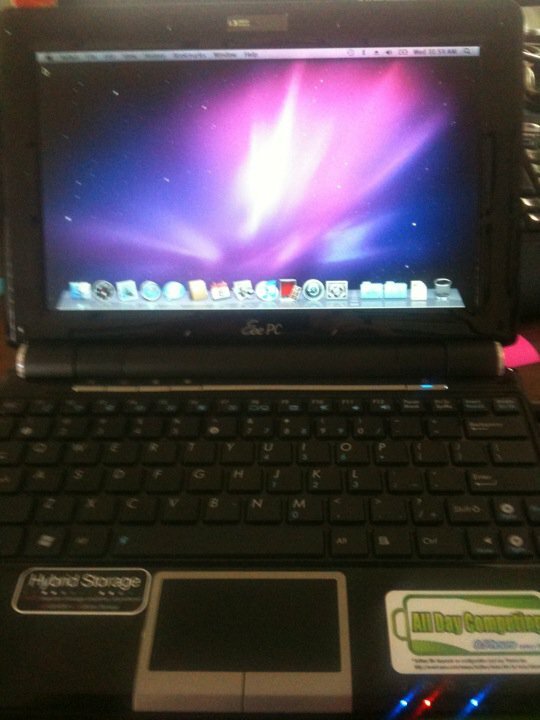 Yes, that is OS X Snow Leopard running on an ASUS EeePC 1000HE. Who needs stinkin Macs, right??? Actually, this was a fascinating exploration into the way that operating systems are built. I’ve been a closet Linux fan for years. I can still remember working with Red Hat 6 when I interned at IBM. And my backup machines around the house have always had some flavor of Linux on them. I’ve emerged Gentoo and built Slackware. I’ve dropped in Fedora and Ubuntu. I’ve even used Debian. Once. So I’ve gotten a lot of practice installing OSes on systems. Enter the guys over at Insanely Mac. Those guys have installed OS X on everything that they could, including a toaster. And so I started researching the forums, initially intending on installing OS X on my backup Lenovo/IBM Thinkpad T60. Lo and behold, I find out that most of the hardware in the T60 will work, but my particular wireless card is a no-go. But, the netbook that’s been lying on my desk collecting dust for the last six months is fully supported. The camera, the wireless card, everything! So off I set to complete my evil scheme. I procured an OS X install disc. Legally, of course. The I read THIS THREAD. REPEATEDLY. I borrowed one of the Mac Guy’s systems. I didn’t really tell him what I was doing. I first tried to use an 8 GB USB drive to perform an install, but I could never get the OS to install correctly. So I formulated Plan B and just pulled the drive out of the netbook and did a complete install. I blew away the partitions and created a single OS X partition. And an hour later, I have a complete OS X install on my netbook drive. After reading the thread again, I downloaded the software to make the installation bootable. I copied over the KEXT files (which are basically drivers for OS X). And after all of that was completed, I disconnected the drive and reconnected it to my netbook. And I rebooted. This was possibly the most nerve wracking part. I knew the installation was good, as the drive booted on an iMac. But would it work on the netbook? As the gray Apple boot screen spun and spun, I sat transfixed. I waited for a crash or a kernel panic. I was no stranger to kernel panics, so I knew if I could get a diagnostic message I’d be good. But, that was not to be. A frozen gray screen stayed up for about five minutes before I rebooted. I checked my BIOS settings to make sure the settings listed in the forum guide were disabled. This time on the reboot, things came up a little faster. It turns out that OS X was building some system files in the background and I just needed to have a little more patience. But finally, I was greeted with a desktop! The camera worked. Bluetooth worked (but I couldn’t turn it off). But no connectivity. Wired Ethernet was not there. No WLAN card detected. I figured that the networking would be the hardest part to configure, but I’m not The Networking Nerd for nothing! As it turns out, the Ethernet driver was linked in the post. After I copied it over to the netbook and did the convoluted driver install procedure for OS X, wired Ethernet worked after a reboot. As the system came back up, I checked the BIOS once again for issues and found that the dreaded “Boot Booster” was still enabled. According to the Interwebs, Boot Booster caches BIOS settings from the last boot and uses them to speed boot times by about a second or two. It also seems to freak out the WLAN card in OS X. After I disabled the Boot Booster, the wireless card miraculously started working! I updated the installation to 10.6.1 using a combo update and reapplied settings as outlined in the last page of the above thread. I stopped there as Apple removed support for the Atom processor as of 10.6.2, requiring some nifty kernel patching to put the support back in. I decided that 10.6.1 was acceptable enough for me right now for testing. And so I’ve been using my little MacNetBook on and off for the last few days. Based on the recoils of horror from some of my Twitter followers, I’ve even made the hostname ‘abomination’. How do I like it? So far, to me it doesn’t really feel much different than Linux. There’s a bit of a learning curve (better than my Windows-to-Linux curve), and the software installation routine is much, much better than RPMs. But all in all, I think I’m going to need to use it a little more to get a good opinion. And I’m probably going to need to install it on a full-sized machine to use it more often than I do now. In the end though, it was nice to prove that I could do something not entirely supported by anyone other than the community. It brought back my Gentoo days, and all my original Linux fun from the Red Hat 6 days. And it proved that no OS is locked down too tight given enough bored people out there. This entry was posted in Apple by networkingnerd. Bookmark the permalink. Welcome to the Dark Side …..